The 2014 hunt season is open. During the first three weeks of archery the harvest was 37 deer and 24 hogs. Compared to last year at this time of 26 deer and 15 hogs, we are off to a good start. Please continue to hunt responsibly. There are two recent additions to the marked trail map. Trails 16 and 17 have been added in the recent past. We also have a new camp director. We are pleased to welcome back Janice Kerber as EYCC director.Nice work on your first summer back with short notice! The Friends of Corbett was established in November,2000 as a not for profit organization to facilitate cooperation between the wildlife management area (habitat and recreation) and the Everglades Youth Conservation Camp (EYCC)(education). In 2004, Pine Jog, a division of Florida Atlantic University (FAU), assumed the duties of the youth camp. In 2014, the EYCC became part of the Florida Youth Conservation Centers Network (FYCCN), again associated with The Florida Fish and Wildlife Conservation Commission (FWC). The JW Corbett Wildlife Management Area is approximately 60,000 acres of Cypress, Pine Flatwoods, Sawgrass Marsh, and Hardwood Hammocks that accommodates hunting, camping, fishing, horse and hiking trails as well as nature observation. It is conveniently located north west of West Palm Beach. 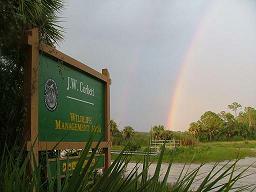 Mission Statement: To assist and support the Florida Fish and Wildlife Conservation Commission in activities at the JW Corbett Wildlife Management Area and Everglades Youth Conservation Camp to maintain and improve natural and cultural resources and nature-based recreational opportunities while enhancing environmental awareness of youth and visitors. Board meetings are typically held the third Thursday of even numbered months, at 7:00 pm in the FWC's regional office at 8535 Northlake Blvd, West Palm Beach, Fl 33412. Additional information about the area can be found at the FWC web site (Corbett information). We encourage you to enjoy the area responsibly. The biologist expect to receive several more RCW transfers this year. The populations of RCW are doing very well.